You're on a team of mastermind thieves, but someone in your ranks has been taking an unfair share. You've broken into his vault to take back what is rightfully yours. Fortunately, you've got experts in every field; and a man in the van that charges by the minute. How many treasures will you be able to uncover before your time (and budget) runs out? 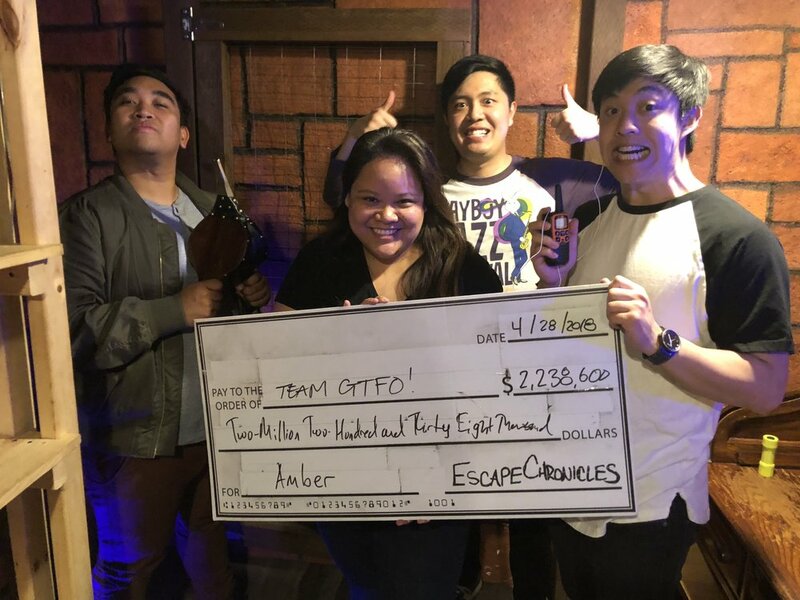 This escape room was suggested by Jackie, one of the GMs from Evil Genius Escape Rooms. WOW! This escape room was crazy good! Andrew, one of the owners, was our GM and he was very friendly. He shared stories about how the company began as a cardboard model escape room before they went into serious development. He also was an avid board gamer. The layout of the escape room was very unique. All four of us had roles, a sweat band with reading material about our role and a special item. I was the muscle of the group, so I could punch stuff. hehe. The purpose of the escape room was not to escape, but to steal/find objects worth the most money. The objects and time remaining together will determine your final score. So different and so cool! Our group immediately loved this escape room once we were given our roles. You start with your group separated and you have to work together. Make sure you read your sweatband! The room was small, clever and immersive. The puzzles were challenging, fun, refreshing and satisfying once completed. This is another escape room that should be on the top of everyone's to-do list. Smugglers Tunnels is very under-rated. Check it out.